Turn Your PC masterwork into Crisp Video Image. Enjoy PC games, PC movies and Internet on TV. Convert your presentations to video, etc. Down converts XGA SGA VGA to TV resolutions. 1024x768, 800x600, 640x480 to NTSC or PAL Plug-and-play design, no drivers required. Cross-platform compatibility for PC or Mac. Traditional Zoom & Pan. Vert/Horz overscan/underscan control. Simultaneous display on PC and TV monitor. 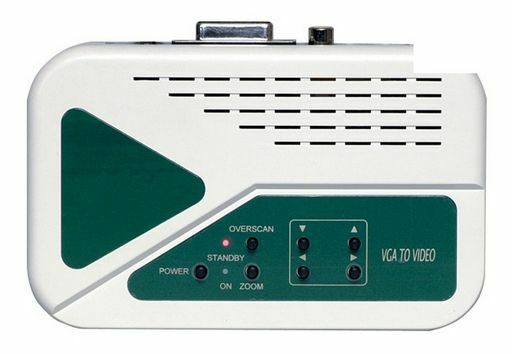 Composite, S-Video (S-VHS or Hi-8) output. Supports scan rate from 50 Hz up to 100 Hz. High clarity 5-line anti-flicker filter. Compact. Convenient. Palm size.